The earliest forms of money in Britain have taken several mediums based upon commodity values. However, Celtic bronze rings are quite common in Britain and served as a medium of exchange. 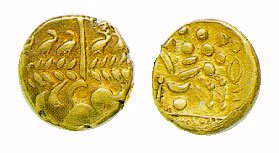 Money in the form of uninscribed coins first appeared in Gaul and made their way to Britain by means of trade and by the migration of Belgic peoples from the continent. The Gallo-Belgic coinage issues most likely date from the late second century BC. The Celtic tribes had employed designs which used the first gold staters from Greece that they had encountered. These were the staters of Philip II, King of Macedonia (359-336 BC) father of Alexander the Great. Obviously, Gallo-Belgic tribes had some trade contacts with the Greek worldin order for the staters of Philip II to become common enough for them to attempt to imitate. Two primary events on the European continent helped to create migration to Britain. First: Germanic tribes began pushing westward across the Rhine putting stress upon the Gallo-Belgic tribes. Second: Refugees fleeing from the advance of Julius Caesar’s Roman legions also created a migration pattern from Europe to Britain. It may have been this obvious escape route that led Caesar to first launch a expedition to Britain. Whenever conflict threatens a community, leadership become imperative for survival. We can see from the historical record of the coinage, that by the 1st century BC, Celtic Dynastic issues displaying the names of tribal kings begin to emerge. We also begin to see a much greater design influence emerging from Rome showing the impact that Caesar’s campaign in Gaul had within Celtic culture. While many of the kings known from surviving coinage are lost to recorded history, we do have Julius Caesar’s Commentaries and other sources who have shed some light on the Kings of the Atrebates, Regni and Catuvellauni. Following the Conquest of Britain by Emperor Claudius in 43 AD, Roman influence in Celtic coinage design became unmistakable. 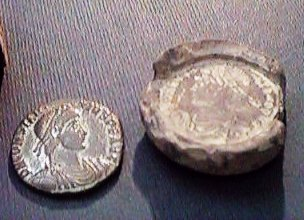 Despite the notion that Romans were cruel conqueres, they often left local religions intact as well as local municipal coinage authorities. In the case of Britain, Celtic coins were permitted to circulate freely along with those of Rome itself. This policy would come to an end following the kenian revolt of 61 AD, in which Colchester and London were sacked with the massacre of over 70,000 Romans. All independence in Britain was terminated and the legal coin of the realm became exclusively Roman. Britain was a province of the Roman Empire from the middle of the 1st century AD until the early part of the 5th century. From Rome’s perspective, its Eastern provinces were lands that were accustomed to civilization long before the Romans were themselves. The Western provinces were lands that were essentially carved out of the barbarian hoards and as such far less cultured. For this reason, monetary policy was quite relaxed in the East while strictly controlled within the hands of Rome in the West. While “official” British coinage was not minted until the latter part of the 3rd century, we do still see numerous barbarous imitations emerging from Britain as far back as the time of Claudius. For the most part, the money supply within Britain arrived there in the form of payment to the Roman Legions who in turn would spend part of the wages within the local economy or by public works commission by the Romans. There was no central banking system to manage and control the money supply – only government expenditures in a variety of forms. 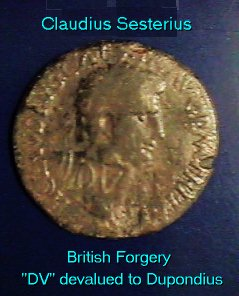 Because Britain was on the fringe of the Roman World, there appears to have been a lucrative industry in conterfeiting particularly the Roman bronze coinage of Claudius. 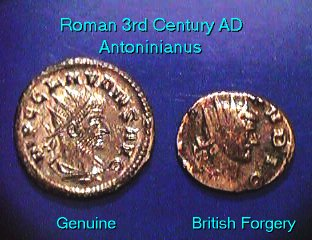 By far the most frequently encountered contemporary forgery is that of the As, but we also see Dupondius and Sesterius specimens as well. It is clear that there was a shortage of bronze coinage particularly on the frontier and the British certainly did their part to fulfill that need. One very strange practice during this period was the counterstamping of Roman bronze coins by the Roman monetary authorities. Ccounterstamps on particularly the Claudian bronze denominations applied by Nero, may have been the result of weeding out numerous British forgeries that had been introduced into circulation. It is also possible that some of these counterstamps were merely an advertisement of a change in legal authority, since we do find similar counterstamps by Tiberius and Claudius during their reigns. However, the Nero counterstamps appear to also include devaluing very worn bronze coinage as well therefore we do find some attempt perhaps by Nero to certify the value of outstanding bronze issues. Here we have a British forgery of a Sesterius of Claudius counterstamped “DV” clearly devaluing it to that of a dupondius. 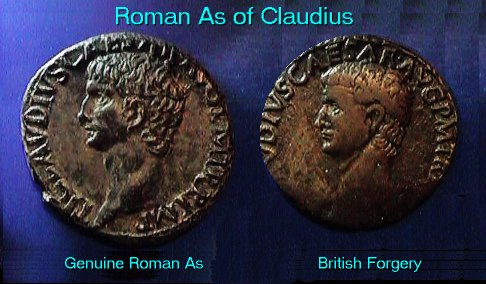 The existence of British forgeries of Claudius in hoards well beyond his reign suggest that the British most likely continued to imitate the coinage of Claudius for some time and did not change their practice with each new Emperor. While the Roman conquest of Britain was never complete, the monetary system was very much Roman over the next several hundred years. Various Emperors visited Britain and some attempted to complete the conquest, but without success. Numerous revolts always plagued the Roman province since the 1st century AD and the famous story of Boudicca, the “British Warrior Queen.” Sometime during the later period of Trajan’s reign (98-117 AD) or perhaps during the early days of Hadrian’s reign (117-138 AD), a major British revolt succeeded in destroying the 9th Legion stationed at York. It was most likely this incident, which led to the partitioning of the island known today as Hadrian’s Wall. Britain became a feature during the mid to late3 rd century. Once again, numerous forgeries began to eminate from the island. Huge quantities of these unofficial antoninianii began to emerge known today as ‘Barbarous radiates.’ This were crude copies of the coinage of Claudius II, Tetricus I and Tetricus II. During the later decades of the chaotic 3rd century, the British usurper Carausius mad a bid for power which resulted in London becoming at last a mint within the Roman Empire. Carausius established two mints in Britain; one in London, the other possibly Clausentum. After the defeat of the British rebellion by Constantius I, London became an official Roman mint, with a substantial output of billon coinage until its closure, by Constantine the Great, in 325 AD. British forgeries once again appear during the mid 4th century. The most common imitation being that of the bronze cententionalis of Constantius II showing the soldier spearing a fallen horseman. Given the quantity in existence today, it is likely that this was also a flurishing industry in Britain once again. According to the Greek historian Zosimus, three British usurpers appeared between 406 and 407 AD. The first two, Marcus and Gratian, were quickly killed perhaps by their own troops. The third usurper was Constantine IIIwho withdrew the Roman legions from Britain. Constantine III set in motion a major economic decline in Britian during which commercial life all but disappeared. When Constantine III took the Roman legions out of Britain for a bid to take Rome itself, the first Saxson invaders appeared in 408 AD. After the defeat of Constantine III by the Emperor Honorius, the legions of Rome never returned. In 410 AD, the Emperor Honorius wrote the the cities of Britain telling them that they should provide their own defenses. Thus 410 AD marked the end of Roman rule in Britain. With the Roman legions gone, the formal end of Roman Britain was followed by a Romano-British civil administration, which continued to operate for brief period afterwards. However, the withdrawal of Roman forces set in motion a gradual decline of central administration which eventually resulted in a rapid deterioration of civilized trade, commerce and ultimately the money supply and the collapse of Roman law. Britain’s slip into the dark ages was hastened by the Teutonic raiders and settlers that followed. The decay of urban commercial life was significant and served as a precursor to what the Western provinences of the Roman Empire itself would undergo by the hoards of barbarian invaders in late 5th century.